An East Cleveland mother is under arrest and her toddler is in the care of relatives after the three-year-old was found wandering barefoot in his pajamas Sunday night, according to East Cleveland police. "We don't know how long the child was wandering out there, so obviously this could have gone real bad," said Sgt. Bill Mitchell of the East Cleveland police department. Officers picked up the child, who was unharmed, in East Cleveland around 6 p.m. Sunday night. That was after a passerby noticed the boy alone in the street. "I’m just thankful that a concerned citizen saw something wrong, did something about it and notified us,” added Mitchell. Police said they searched the area for the boy's parents for an hour, but they were nowhere to be found. Another hour later, his mom called police looking for her son. "She said she fell asleep," Mitchell said. The toddler's mom was arrested Sunday night but no charges have been filed yet. 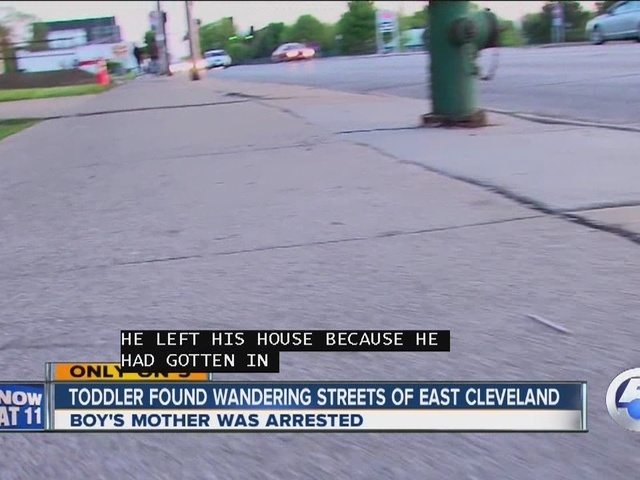 In the course of the investigation, officers learned that the toddler wandered from his home on Savannah Avenue in East Cleveland. He was found roughly a half mile away. Police said he told them that he left his home because he had gotten into an argument with his mother. Police also said that Cuyahoga County Department of Children and Family Services is investigating. In the meantime, relatives will be caring for the toddler.